Every day, stories about bad guys fill the news, but it’s the stories of kindness that really stand out. Whether it’s a fast food employee helping a customer or a group of students checking on a Grandma in the Window, these stories show the importance of being kind. Unfortunately, showing kindness isn’t the norm. Harvard’s Making Caring Common project found that 80 percent of middle and high school students thought achievement and happiness were more important than caring for others. Still, teachers and parents can help turn those numbers around by teaching kids to be kind. Kids tend to model the behaviors of the adults around them. If they see you regularly being kind, they will begin to exhibit kindness in their own lives. Of course, no one’s perfect. There will be moments when you tell someone off, hurt someone’s feelings, or fail to help someone in need. Taking the time to apologize when you were less than kind can also help kids learn a lesson about the importance of kindness. Don’t praise kids every time they act kindly, otherwise they are likely to act a certain way just to receive the praise. Instead, try to point out a few positive moments every week to let kids know you appreciate how kind and helpful they are. While many kids are born with an innate desire to be kind, parents and teachers still need to plant seeds of kindness in their minds. Talk to kids about what they think it means to be kind. Ask them to share memories of acts of kindness. You can open the conversation with these writing prompts, which also make great discussion questions. 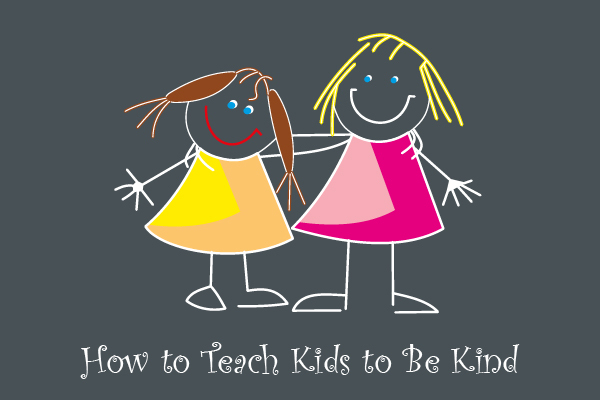 Of course the greatest way to teach kids to be kind is to give them plenty of opportunities to show kindness. These can be big acts of kindness, such as collecting money for charity or taking bags of food to a food pantry, or smaller acts of kindness, such as picking up trash on the playground or giving a friend a hug when they are sad. If you encourage kids to show kindness when they are young, they are more likely to grow up to be kind adults. If you want to take the conversation on kindness a step further, check out Edutopia’s Eight Steps Toward a Kinder World. Remember, kindness matters. Thank you for this wonderful article. I definitely will be using it with my children. This article is full of great teaching lessons for young adults and older adult as well. I believe we all need a remedial course in kindness. Sometimes people life experiences can caused them to be bitter. Thanks, Evangelist Edith Perry,Adult Sunday School teacher. Thanks a lot for the article, it reminds the importance of being nice to other people.